Lately I have been scanning the shelves of the local stores, eagerly looking for any sign of the 2015 Bratz dolls by MGA Entertainment. 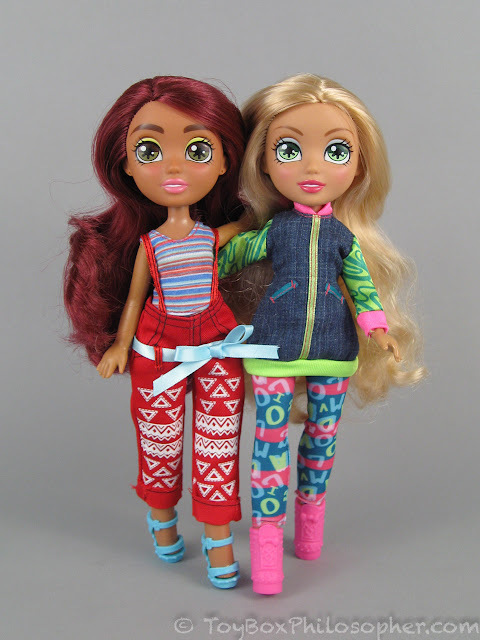 While I've yet to see anything new from Bratz, MGA did debut a completely different doll line back in January. Several of you have been noticing these dolls in the stores and asking if I would write a review. I am extremely happy to do this review because the newcomers look quite different from most other dolls on the shelves right now--and I am always excited to see something truly new. The doll brand is called "Vi and Va," which is short for "Viviana and Valentina." The brand name also sounds like the word viva, which means "live" or "long live" in Spanish, Portuguese and Italian. Viviana and Valentina are a pair of teenaged sisters who are also close friends. The other dolls in the line are the sisters' two cousins, Roxxi and Felicia--who are also friends. MGA's website does not have a huge amount of backstory about these characters, but I get the sense that the girls are Latina and that the line is meant to center around close families. Viviana (left) and Felicia (right) by MGA Entertainment, $16.99 each. Chelly Wood's Epic Stop-Action "Romeo and Juliet" Film--A Guest Interview! About a month ago I got an email from a lovely fellow blogger, Chelly Wood, who is working on a special project with her two daughters. Chelly explained that she and her girls are using a collection of dolls to make a stop-action version of Shakespeare's classic, Romeo and Juliet. How cool is that? I was immediately in love with this idea--and not just because I like doll-related things. I also have a special fondness for stop-action movies. When I was a kid, my friend and I used to make these elaborate stop-action sagas with my Playmobil figures. And that was way before laptops and stop-action technology--we just turned the Betamax (yes, Betamax...) camera on and off as we captured our shots. It was so much fun. The other thing that I like about Chelly's work is the amount of care and research that is going into her production. Chelly and her daughters give attention to every little detail--from costumes and hair to scenery and props. My limited experience with making movie clips for the blog has given me a great amount of respect for the time and effort required to complete this kind of project. I am not the only one who is impressed: Chelly's endeavor is already getting media attention, with a story in the Chicago Tribune and a doll-craft article in Designer Dolls Magazine. I thought it would be fun to showcase Chelly's project here on the blog while the film itself is still in production. I am always interested to learn about the details behind a creative venture like this one. Knowing the backstory often adds to my anticipation for--and enjoyment of--the final work of art. In the upcoming months, you can find updates and news about Romeo and Juliet on Chelly's own website. I hope you guys are as enchanted by this special project as I am! 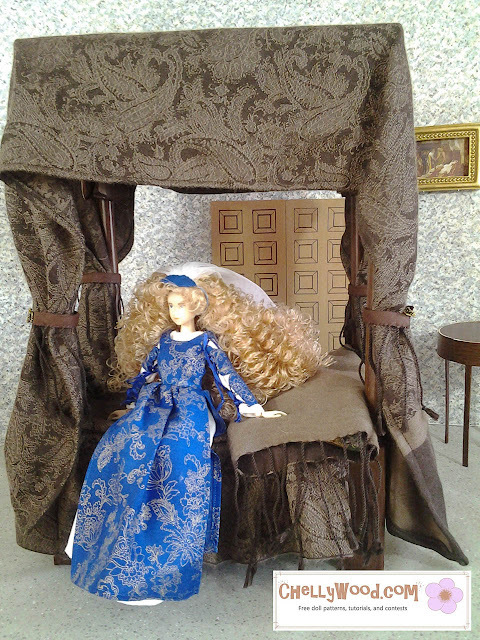 Juliet relaxing on one of the beautiful handmade sets of Romeo and Juliet. "Frozen Fever" Anna and Elsa Dolls--A Comparison Review! After limping along for a few months, my valiant six-year-old computer finally reached the Point of No Return. It might have--just a thought--had something to do with the 28,000 photographs stored on its hard drive. Anyway, I have been transitioning to a newer computer over the past few weeks. I knew this would be a challenge (let's just say I'm not someone who thrives on change...) but it was trickier than I expected. The biggest hurdle was to move from my ancient iPhoto software to a fancy modern photo processing program. You might notice a few changes and quirks as I continue to get used to all of these new-fangled things. I probably should have written a few shorter reviews as I got accustomed to my new set-up, but a side-effect of my aversion to change is that I pretend everything is going to stay the same...and I don't plan ahead. I just stubbornly do what I would have done in a never-changing world. Basically, I was really looking forward to writing this Frozen Fever comparison review and didn't want to compromise. So...it took me a while to finish. Both Mattel and the Disney Store made Anna and Elsa dolls for the Frozen Fever short film that accompanied the recent Cinderella movie. I loved this short film--especially when I was watching it in a movie theater full of little kids. The giggling was contagious. I really wanted to have a doll souvenir from this cute film--like I do for most Disney movies. I typically prefer the Disney Store versions of movie-themed dolls, but when I saw that Mattel had changed their Frozen dolls for this release (Anna has a really different face mold) I thought it would be fun to do another comparison. 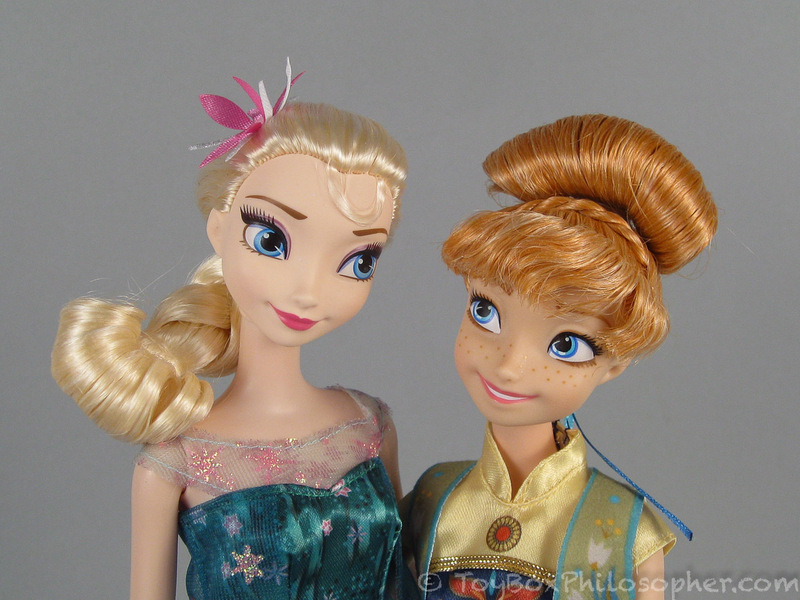 Mattel's Frozen Fever Elsa (left) and Anna (right), $14.99 each.